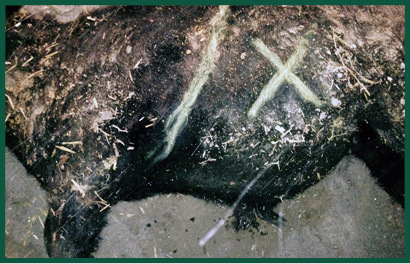 Dead animals are an inevitable part of a livestock operation. Livestock owners can dispose of dead animals by composting. This guide offers step-by-step instructions for a livestock owner to follow. Place 2 feet of base material in pile or long row, depending on number of carcasses to be composted. Lay carcass on top of base. Have at least 1 foot of base material between perimeter of carcass and edge of base. If composting cattle, puncture the rumen to prevent it from exploding. Cover carcass with 8 to 10 inches of bulking material. Cover the entire pile or long row with 2 feet of cover material. Make sure pile always has sufficient cover material. Turn pile every six months from early spring to late fall. To accelerate composting, turn pile every two months from early spring to late fall. Do not disturb pile or long row during winter months. Existing compost can be used to cover new piles or long row sections.